Home » Crochet, Knitting and Knotting » To Knot or Not! A friend from our Arizona travels tweaked my interest in the craft of tying knots. I managed at the time to stay focused on other activities but something caught that day. A little later I spotted a book in a clearance bin in Michaels and picked it up – 75 Chinese, Celtic, & Ornamental Knots by Laura Williams and Elise Mann. The book got tucked away but resurfaced this fall when we were repacking for our winter travels. Just about the same time I received a FB invite to join a group on FB – Mateloteurs – an international knotting community. Looking through the fantastic work shared on that site I really became interested and opened the book…..
Knotting is certainly one way to pass the time….. To test the waters I decided to try out some of the knots illustrated in the book. I’m now on my eleventh sample and can’t put it down. 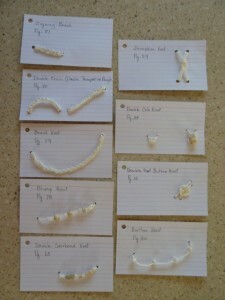 I am now onto knots that would make great chains to combine with beads for jewelry……. Will I or won’t I? I haven’t invested in any equipment yet…..